Mini Vegan Cheesecakes. These mini vegan and gluten free cheesecakes are so good! When I made my dairy free sour cream the other day, I was thinking that it might be the perfect base for a vegan cheesecake. Turns out I was right. 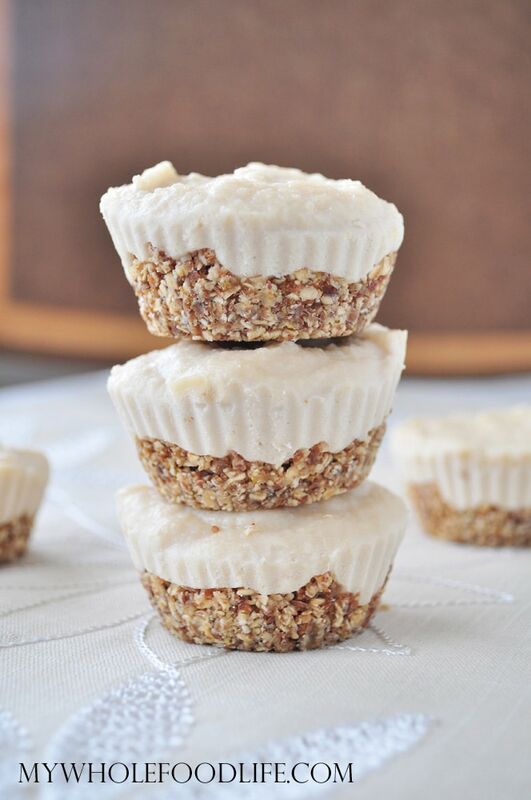 You are going to love these mini vegan cheesecakes! They are just the right little bite of heaven. Honestly, I don’t think these vegan cheesecakes taste much different than the real deal. Although it’s been a long time since I have had an actual cheesecake. These would make the perfect dessert for those that suffer from a dairy allergy. I am beginning to think there is nothing that cashews can’t do! Dairy free and guilt free mini cheesecakes! In a food processor , combine all the ingredients for the crust. The dough will look loose, but I promise it comes together once it's chilled in the fridge. Press a little bit of dough into each lined muffin cup. I use standard sized muffin pans with silicone liners . Paper liners will work as well. Stick the muffin pans into the fridge as you make the filling. Place them into a food processor with the rest of the filling ingredients and blend until smooth. Spoon the filling into each muffin cup. I filled my standard muffin cups all the way to the top. Stick into the fridge to set. This should take about 2 hours. If you need a grain free option, you can use almonds instead of the rolled oats. These cheesecakes should keep for a couple weeks in the fridge. Enjoy!